Big news for owners of Android phones: Today, Google announced the official launch of Android Pay, the company’s answer to the Apple Pay mobile wallet. The new payment feature works with any NFC-enabled Android device running KitKat 4.4 or newer at over 1,000,000 locations in the United States. Note, however, that it may still be a few days until the Android Pay app appears on your Android phone. Android Pay is a way to make purchases at retail stores using just your phone. You’ll need to save your credit card data to your phone, but if security is a concern, you can remotely wipe a lost or stolen Android phone at any time. And there’s another added security benefit to Android Pay: When you make a purchase using Android Pay, your credit card information is never shared with the retailer. They instead get a one-time use token number, better protecting your bank account information from cyberthieves. Android Pay sends purchase confirmations to your phone when transactions happen, too, so you can better track your card usage. To set up Android Pay in your phone, you’ll first need to have a debit or credit card that supports the payment system. Participating issuing banks include American Express, Bank of America, Discover, Navy Federal Credit Union, PNC, Regions Bank, USAA and U.S. Bank, with Wells Fargo support coming in days. Capital One and Citi will add Android Pay support soon too, Google notes. You can then use your Android Pay-enabled phone at a number of major retail stores in the United States. Participating stores at launch include Aeropostale, American Eagle, Babies R Us, BJ’s Wholesale Club, Bloomingdales, GameStop, Jamba Juice, Macy’s, Office Depot, Office Max, Panera Bread, Petco, Rite Aid, Sports Authority, Staples, Subway, Walgreens, Toys R Us and Whole Foods. Like with Apple Pay before it, it’s reasonable to expect that Android Pay will soon be accepted at most national chains and a few select local boutique stores. If you have the Google Wallet app on your phone, it will be updated to the Android Pay app in the coming days. You can find the free Google Wallet app on Google Play. After reading this article about Android Pay Mobile Payment, I noticed it is referring to phones .. I am curious if that could possibly move to the tablet at some point? 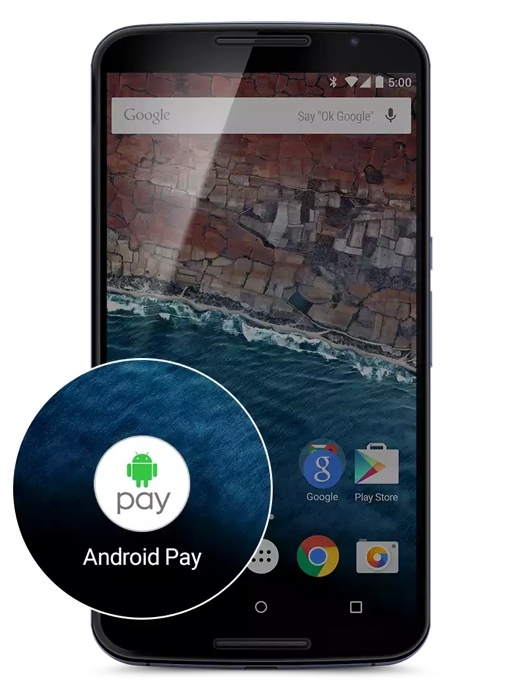 Android Pay should work on any NFC-enabled Android device, phone or tablet. If you go to the Play Store and see the app for download, then your device is compatible.